This post is brought to you by Dollar Tree Value Seekers Club. My husband says I have a "glass jar problem." If a glass jar comes through our house, chances are we're keeping it. 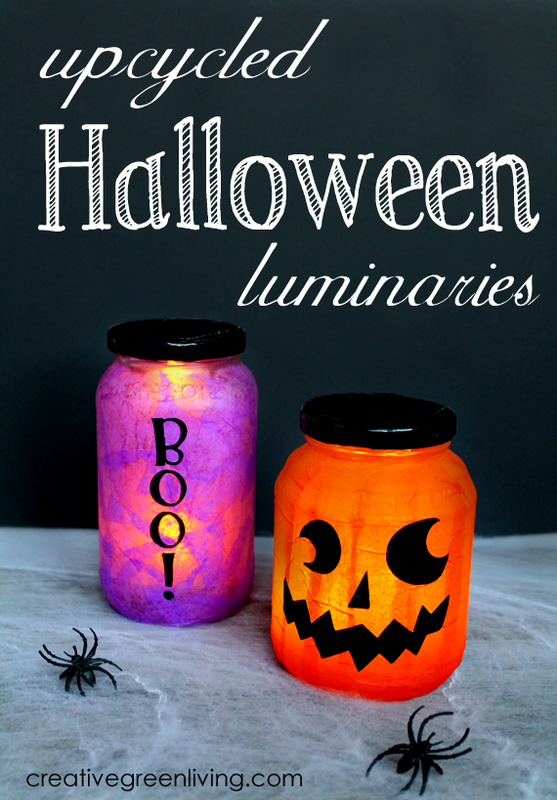 They are just so darn useful for everything from food storage to crafts (like these great luminaries I'm about to show you from the Dollar Tree Value Seekers Club) - why in the world would you throw them out?! Dollar Tree asked me to check out their Value Seekers Club (confession: I was actually already a member!) and to recreate one of their October crafts. I was immediately drawn to these luminaries and figured they would be a great way to use up some of my glass jar stash. Of course, if you don't have a glass jar stash (ahem) you can pick up lots of great jarred goods at Dollar Tree or even vases and candle holders to use instead. I may or may not be guilty of checking out their grocery section just to look for glass jars I like the shape of (don't tell Joe!). Cute, right?! I'm sure you can see why I was drawn to this project. I made mine a smidge differently than Dollar Tree - in part because I wanted mine to live outside. Check out how I made mine below. 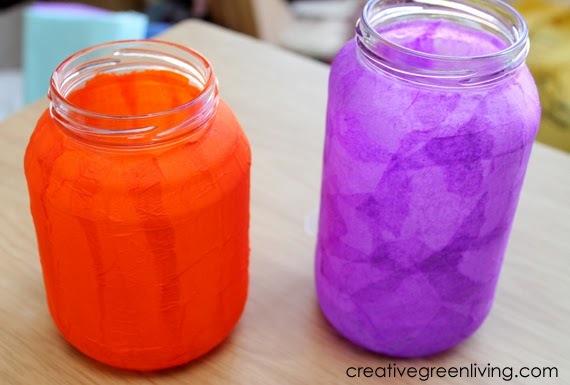 I went ahead and covered my jar with purple tissue paper and an orange napkin per the instructions on the Dollar Tree project sheet. I used Martha Stewart Decoupage Medium because I had it on hand and it is weather proof. Mod Podge Outdoor would work great, too. Important: If you want to use the lids like I did, do not cover the threads of the jar with tissue paper. Leave them bare. Instead, of gluing on black construction paper as suggested by Dollar Tree, I used black duct tape cut outs. 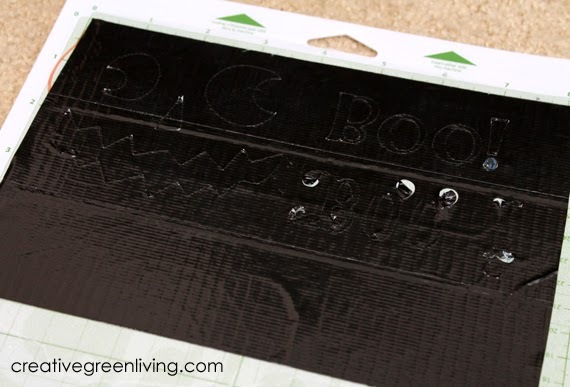 Easy, cut, and no need to wait for glue to dry. Option 1: Draw your pumpkin face shapes and Boo! letters in mirror image onto the wax paper side. Then cut out with scissors. Option 2: Use your craft cutter to cut out face shapes and letters from the duct tape for you. I went with option 2 and used my Cricut Mini Cutting Machine. The face graphic is from the Close to My Heart: Artiste: Halloween cartridge. The letters are from the Alphalicious cartridge. I set the depth to 4, the pressure to 4 and the speed to 2 when I cut it out. Regardless of which method you use, the tape should peel right off the wax paper like a sticker when you are done cutting out your shapes. Go ahead and stick them to your jars. 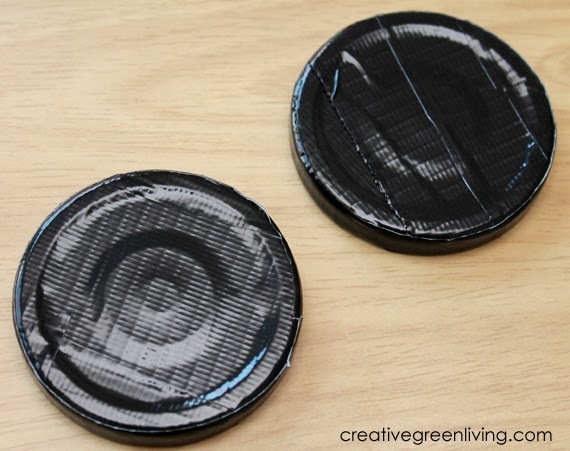 Use the duct tape to cover your jar lids. I recommend covering the top first, then cutting a thin strip to run around the edge next. All done! Add your light and you're good to go! I love how these turned out! 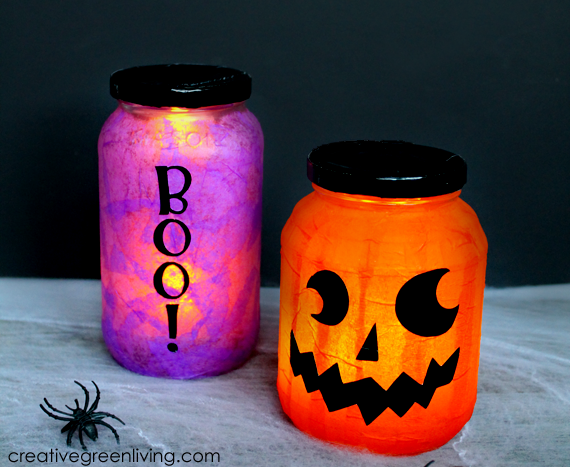 If you are looking for easy, inexpensive Halloween projects, be sure to check out the Dollar Tree Value Seekers Club. Membership is free and you'll never get bored because the content changes all the time (come back next month for more cool decor, projects, recipes and tips!). The great folks over at Dollar Tree are letting me give away a $100 Dollar Tree gift card so you can get your craft on, too! All you have to do is join the Dollar Tree Value Seekers Club (it's free!) and tell me which email address you used to sign up with using the Rafflecopter widget below (if you are looking at this post in email or a feed reader, click over to the post on my site to see the Rafflecopter widget in order to enter). Good luck! Disclosure: This post was sponsored by Dollar Tree in conjunction with The Blueprint Social. I was compensated for my time spent creating and writing about this project. All opinions and modifications are my own. Please see my complete review policy for more information on sponsored posts. Cute craft! I am such a Dollar Tree lover!!! I drive 20 minutes to my nearest DT instead of visiting the 99 cent store which is 5 mins away!